Since 1978 the Lovejoy Health Center has been providing care to families in Albion. At our health center, the top priority is the wellbeing of our patients. Our staff works with our patients to create a ‘medical home’ and the best care possible while utilizing state-of-the art knowledge and technology. Click here to learn more and to watch a video: Patient-Centered Medical Home. Lovejoy Health Center staff includes a team of medical providers, behavioral health consultants, a psychiatric mental health nurse practitioner, as well as clinical and administrative support staff. With our team we are able to offer a variety of services based on our patient needs. Our providers also maintain a strong working relationship with MaineGeneral Medical Center if patients require further testing or hospitalization. 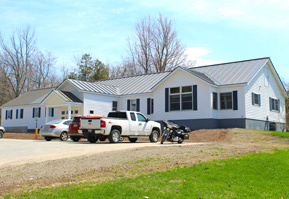 Serving local communities in the Albion, China, Freedom, Palermo, Thorndike, Troy, and Unity area, Lovejoy Health Center is located in a family-friendly town and rural family farming community. Albion's history is also linked to Maine's narrow gauge railway, whose trail is now used for hiking and snowmobiling. As a rural farming community, Albion is home to some of Maine's largest dairy herds. The highlight of each summer is Fireman's Field Day, which includes several events and a parade, bringing the whole community together.